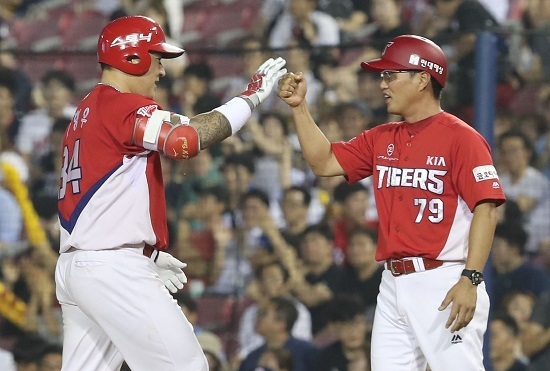 In a possible playoff preview, the first place Kia Tigers came to Jamsil Stadium on Friday for a three-game series against the third-place Doosan Bears -- the winners of the last two Korea Baseball Organization championships. Doosan entered the series on a hot streak, having won their last seven games, but Kia came in with a three-game win streak of its own. The vaunted Tigers offense struck first in the opening game. In the top of the second, third baseman Lee Beom-ho doubled to score Choi Hyoung-woo, but despite having runners on first and second with only one out, Kia would only manage the single run, taking a 1-0 lead. Doosan evened the score in the fourth. Center fielder Park Geon-woo walked, advanced to second on a Nick Evans single and stole third base. When Evans was caught in a rundown trying to advance to second after Min Byeong-hyun struck out, Park took advantage of the confusion to come to the plate with the equalizing run. But Kia retook the lead immediately in the next half inning. Kia first baseman Kim Joo-chan hit a long fly ball to left field that appeared to have been a two-run home run, but video review showed it stayed within the field, limiting Kim to an RBI double and Kia to a 2-1 lead. Doosan threatened in the sixth, loading the bases with one out against Kia starter Pat Dean. But Dean, having thrown well over 100 pitches, was bailed out by center fielder Kim Ho-ryeong, who made a diving play on Oh Jae-il’s tailing liner. Dean then induced Heo Gyeong-min to pop out, ending the threat. As Kia scored an insurance run in the eighth, Doosan entered the bottom of the eighth trailing 3-1. But pinch hitter Kim In-tae, hitting a measly .152 on the year, singled home Kim Jae-hwan to cut the lead to 3-2. In the bottom of the ninth, Doosan dramatically equalized the score with two outs. Park Geon-woo drew a walk, then Kim Jae-hwan hit a liner toward Kia center fielder Kia Ho-ryeong, who could not repeat his sixth inning heroics, only managing to knock the ball down on his dive. Park, who took off the moment the pitch was thrown, scored all the way from first, and the game was sent to extra innings. Neither team could score in the next three innings, as game one was called a 3-3 tie. Game two featured a pitchers’ duel between Doosan starter Michael Bowden and Kia ace Hector Noesi. Bowden threw six strong innings, striking out five, his only mistake being a two-run home run to Tigers right fielder Kim Joo-chan in the third inning. However, that home run would prove the difference, as Noesi was even better, conceding only a single run over his own six innings of work. Both bullpens threw three scoreless innings for a 2-1 Kia victory. Doosan’s offense broke out in game three, jumping Kia starter Im Gi-young for six runs in his 4 2/3 innings of work, and Bears ace Jang Won-jun threw seven strong innings for a 6-4 Doosan victory and a series split. Kia and Doosan have so far split their season series 5-5-1. They will meet against at Jamsil Stadium on Aug. 18. Doosan left fielder Kim Jae-hwan collected hits in each of the three games. Kim now has 134 hits, the most in the league, and is on a 14-game hit streak. Kia’s league-leading offense continued its recent second-half struggles. Kia’s top four hitters -- left fielder Choi Hyoung-woo, center fielder Roger Bernadina, second baseman An Chi-hong and shortstop Kim Seon-bin -- combined to go 5-for-40 (.125) in the series. On Tuesday, Doosan opens a three-game series against the eighth-place Samsung Lions and Kia will go home to play three against the last-place KT Wiz.